Radical left-wing anti-gun activist Cameron Kasky appeared on CNN’s “New Day” program over the weekend where he took a few moments to spew forth some inaccurate information peppered with a few nasty insults for NRA members and President Trump. Kaskey’s segment was primarily focused on getting the activist’s take on the president’s speech at the NRA convention in Dallas. 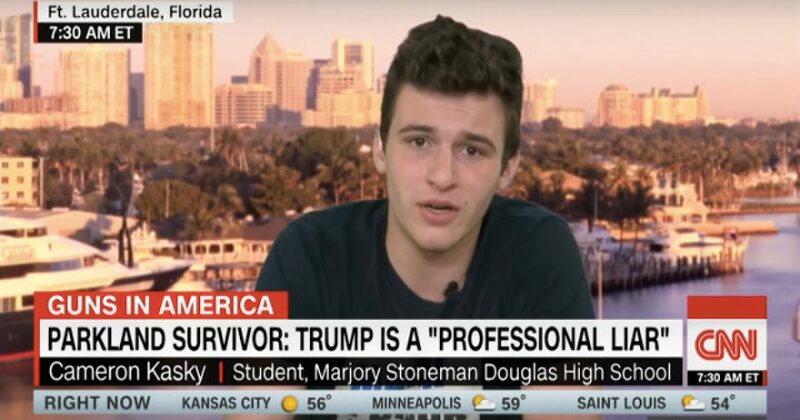 As has become standard practice for CNN, they allowed Kasky to make several false statements without even bothering to fact check what was being stated or to offer any sort of challenge or push back to his claims. This just further serves to expose the obvious liberal bias of CNN as a news organization and validates President Trump’s and the vast majority of American citizens’ distrust of the network. “If you could sit down with the president this morning, what would you say to him?” co-host Paul asked Kasky. Kasky has a well earned reputation for spreading misinformation, and that’s precisely what he did here on several points, yet he went completely unchallenged, allowing this faulty information to hit the masses. First off, his claim that the majority of NRA members disagree with Trump on guns is completely false. The whole point of Kasky’s statement here was to make Trump look like some sort of extremist. However, not long after the Parkland shooting, the president made several suggestions concerning gun control that actually frightened some Second Amendment activists, particularly his comment about confiscating guns without due process, which is a violation of the Constitution. Trump is not an extremist on guns. Much of Kasky’s argument here is likely coming from the fact that two-thirds of NRA members support background checks for purchasing guns, which Trump also supports. However, more than half of NRA members have made it clear they do not support a universal gun registry, which would be necessary for universal background checks. Kasky went on to mention that his dad owns a few guns, but not the kind that can “mow down 17 people in six minutes,” once again perpetuating the myth that AR-15s are automatic weapons. What’s really aggravating here is that CNN didn’t bother to do their job to uphold journalistic integrity and actually check to see if what Kasky said was accurate or true. His statements fit their narrative, so they just allowed it to go forward, regardless of accuracy. Perhaps one day journalists will make a return to objectivity and take their job to inform the public of facts seriously.